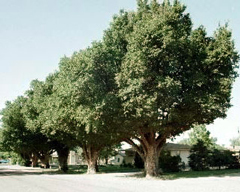 This tree in Colorado Like American elm, English elm is a tree that continues to grace the streets and avenues of our cities and towns. Its characteristic formal oval-shaped crown and dark green foliage make it one of the finest street trees around. Dutch elm disease does infect this tree. However, good sanitation practices now make it worth attempting to grow this elm once again in our parks and along our streets. Hardiness A wide range of soil and temperature tolerance. 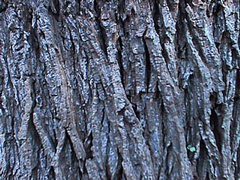 Growth habit Large, introduced shade tree with tall, straight trunk and dense, broad, rounded-to-oval crown. Branches are spreading to nearly upright. Native to England and W. Europe. Widely planted since colonial times and escaping in northeastern and Pacific states. Prefers moist soil locations, however hardy and tolerant of city smoke. 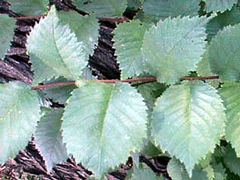 Foliage Deciduous, 2 to 3-3/4″, 1-3/4 to 2″ wide. Broadly elliptical, abruptly long-pointed at tip; base with very unequal sides; doubly saw-toothed. Dark green and sandpapery rough above, paler and covered with soft hairs beneath; remains green late, turning yellow and shedding in late autumn. Flowers 1/8” wide; dark red; clustered along twigs in early spring. Fruit 1/2” long; rounded flat greenish samaras, hairless, with one seed near narrow notch at tip; maturing in spring. Bark Bark gray; deeply furrowed into rectangular plates. Twigs brown, slender, densely covered with hairs when young; sometimes with corky wings.